“Stow-Away” EXP 360 Expedition Vehicle Single Cab Iveco. Earthcruiser Australia is forever evolving, focused and passionate about building the Best Global Expedition Motorhomes possible. The Company runs a program of continual development and improvement along with the introduction of customer customization the likelihood of two identical Earthcruiser’s is decreasing. At Earthcruiser Australia it’s not just what you see that’s impressive it’s the depth of engineering and thought that goes into each and every vehicle. Earthcruiser works with their customers to create a vehicle of their dreams. Managing Director, Mark Fawcett said: “Our fibreglass modules allow for some customization, combined with sound engineering, clever planning and creative fibreglass fabricators, helps to keep the high cost of new fibreglass patterns and moulds for every different scenario at bay”. 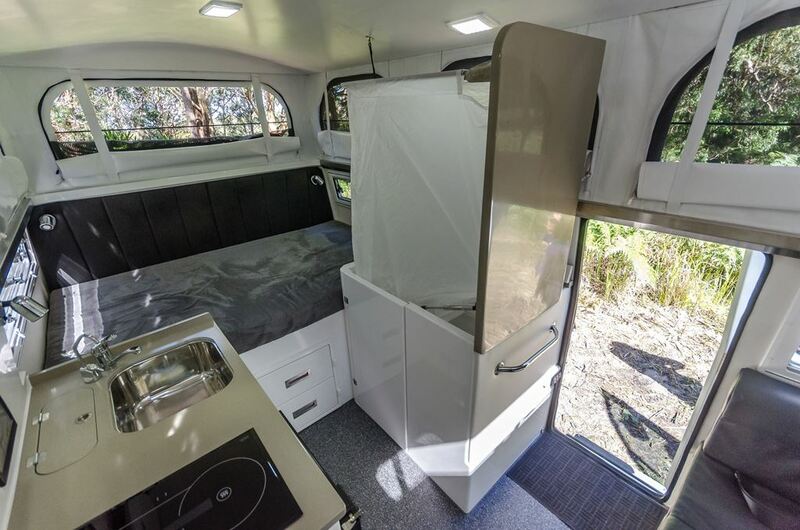 This vehicle is the culmination of the above process, and has been aptly called the “Stow-Away” Mark Fawcett advised that his customers, Peter and Judy’s objectives were to have a more open plan interior with more living area in lieu of the usual storage capacity that Earthcruiser offers. The concept of “The Stow-away” is a smartly tucked away toilet/shower cubicle underneath a benchtop, this allows for the entry way to open up and lead directly into the lounge area without any obstructing walls. Earthcruiser achieved this by creating a more compact toilet/shower cubicle further back from its usual location at the door entry, whilst still allowing a generous entry space without compromising any other areas in the vehicle. The benchtop is brilliantly designed as it has numerous jobs that it has to perform. There are two parts to “The Stow-Away” benchtop, one section of this lid when opened is secured against the wall via a magnetic catch whilst the other is gas strut assisted and easily lifts to reveal the toilet/shower cubicle, as well as the foldable shower ring that includes an advanced anti mould shower curtain that can be stowed wet, with no adverse effects to the material. Many hours of testing have gone into the sourcing and manufacture of our curtains including temperature and durability. When the shower ring is extended and fixed to a point in the ceiling, the shower curtain opens up (only at this point do you realise that this is a toilet/shower cubicle) the underneath of the benchtop is also equipped with the bathroom mirror and housing for the hand held shower head. 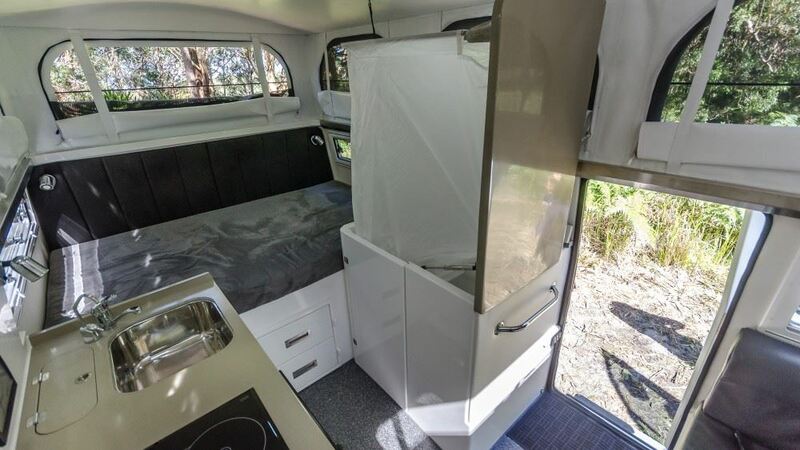 As easily and as quickly as it is setup “The Stow-Away” is just as swiftly packed away for your convenience with the added bonus of an extra benchtop area to utilise as well. This vehicle also features a generous 3 camper seat configuration, double (or couple) seat on one side and a single on the other, so you can spread out and enjoy the space, all fitted with certified seatbelts. This is also a second sleeping area, forming two double beds in this vehicle (sleeping 4). This vehicle was also tailored with many options chosen by the customer for their particular requirements, purpose built Shock Absorbers were fitted to assist with on-road travel without impeding the off-road capability, double entry door with stainless steel security screen allowing for good airflow whilst maintaining a locked door, touch screens permitting more than 50 switching operations, monitoring of tanks and video vision to be seen and operated from the front and rear of the camper. To reassure our clients we have Second Stage Manufacturer Approvals for all our vehicle designs. The system for new vehicles is that all new vehicles modified to motorhomes require a second stage manufacturer compliance approval through the Road Vehicle Certification Scheme (Department of Transport Canberra) and the installation of a Second Stage Compliance Plate by the Motorhome Manufacturer. In addition we have recently contacted the various State and Territory Organisations responsible for vehicle registration and compliance and they have reiterated this standard to us. They have stated that Motorhome conversions prior to first registration must have Second Stage Manufacturer Approval and a Second Stage Compliance Plate fitted. The Earthcruiser boasts of an array of other intelligent and practical features to enhance your Expedition adventure. The options range is constantly growing to meet the wants and needs of our customers such as; Rear Winch mount setups, Diesel Generators, Certified Gun Locker (NSW Police). The latest Earthcruiser Single Cab Iveco the “Stow-Away” is an innovative collaboration, Earthcruiser Australia and their customers work to develop and create each individual Earthcruiser. If you want it on your Earthcruiser, we will find a way! To view our photos of the Expedition Single Cab Iveco Earthcruiser please visit: Peter and Judy’s Earthcruiser in our Gallery.